"True love stories never have endings." Young friends got married today. Making my own wedding card to congratulate them was top on my priority crafting list this week. Lately I have been enjoying the use of my Big Shot more and more, so I got it out to play again and started thinking about how I could make a special project for my friends. First I made my cake image by stamping in Stazon then colouring in the image with my markers. I added some rhinestones to the decorations on top of each cake layer. I edged the image with a marker as well and then I matted it onto Very Vanilla cardstock. 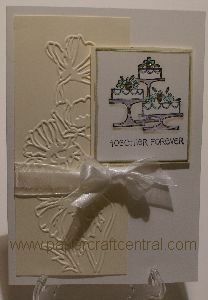 Next I ran some Very Vanilla cardstock through my Big Shot machine with the embossing folder. I trimmed the element to fit on the left hand side of my card front. Using some Organza ribbon, I tied a piece around the Very Vanilla embossed image and made a bow. Tip: If you wanted to make the embossed image stand out more, you could ink it or turn it over and treat it as I have on this Manhattan Rose element. 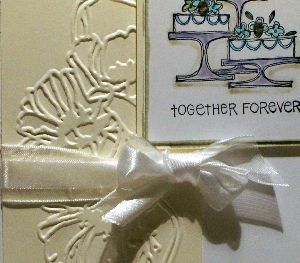 One more thing - for wedding greeting cards2 to be truly finished, find a lovely quote to go inside and sign on the back that you are the card maker. I stamped a quote from God's Blessings (NLA) for the inside on a piece of Very Vanilla cardstock and adhered it to the card base. I made another card as an order for a lady and have featured it on Susan's Saga if you would like to see that. It features its own envelope as it is quite a 3d greeting. May the wedding lead to a strong and happy marriage, filled with blessings! PS: If you live in Australia and would like to order any of the supplies I used that are still current, you can check out the items in my SusanSalutations Stampin' Up! Store.